You probably never would guess that the beautiful flowering dogwood tree would have it "made in the shade." But the fact is, there is a pretty shade plant or sensible shade-tolerant answer to almost any landscaping need. The top performers can come from almost any group of plants, from flowering trees (like the dogwood) to turf and ornamental grasses. Flowering dogwoods are understory trees in the wild and are an excellent choice for shade plants in a landscape. 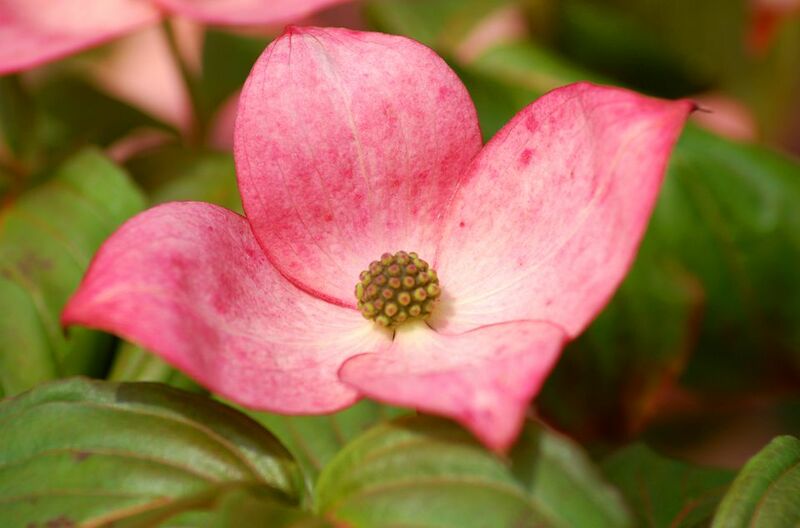 "Cherokee Chief" is one cultivar of flowering dogwood tree (Cornus florida "Cherokee Chief"). Its lower branches have a horizontal branching pattern, lending interest to any landscape design. This flowering dogwood grows to a height of 20 to 25 feet and spreads 12 to 15 feet. Cherokee Chief dogwood puts out rosy-red blooms in spring, while its fall foliage is a red color with hints of bronze. Other types of Cornus florida have flowers that are white or pink. Grow Cherokee Chief in U.S. Department of Agriculture plant hardiness zones 5 through 8. Eastern or Canadian hemlocks (Tsuga canadensis) are shade plants that do not tolerate heavy winds, heavy clay soil, or drought. Hemlocks are best known as forest trees that reach enormous heights (60 feet or more). But if pruned faithfully, it can be maintained at the height you desire. A properly pruned row of hemlocks can even form a dense and attractive privacy hedge. Hemlock is hardy to zone 3. Shade-tolerant red osier dogwood (Cornus sericea "Allemans") dogwood blossoms in white in mid-spring. But it is really not about the flowers with this plant, which can mature to a height of as much as 10 feet and to a similar width. What follows the flowers is more interesting: the white fruit. And even these berries take a backseat to what red osier dogwood is really all about; namely, its red bark. Grow it in hardiness zones 3 through 8. A similar plant is red twig dogwood. While both tolerate shade, you will get more of the red color by giving it more sunlight. Yews (Taxus spp.) are evergreen shrubs that grow in shade. These plants can also be trees, depending on the type you grow. It is a shade-loving plant with a long history. The short, flat needles of yews are dark green on top and light green on their undersides. New foliage in spring is bright green and soft. Yews are relatively slow-growing and can either be left unpruned or pruned into a hedge. The hybrid cultivars of the Taxus x media group are crosses between Japanese yews and English yews. All parts of this plant are poisonous, except for the red berry or aril. However, since the seeds are poisonous, and the seed matures within the berry, the berries should be considered off limits. Keep small children away. Taunton yews (Taxus x media 'Tauntonii') are the best yews for regions with severe winters because it is resistant to winter burn. These shrubs grow about 3 to 4 feet tall and have a similar spread. The plants require a soil with good drainage. Taunton yews are hardy to zone 4. Impatiens (Impatiens wallerana) has been one of the most popular annual gardening plants in the U. S. for some time now, due to its ability to bloom continually, including in shady conditions. Impatiens grow to 6 to 24 inches tall, depending on the variety. This shade-loving plant comes in various shades of pink, rose, red, lilac, purple, orange, and white. In addition to the bleeding heart plants most commonly seen in gardens (namely, Dicentra spectabilis), there are Dutchman's breeches (Dicentra cucullaria) and the fringed bleeding heart. All three are shade plants and cold-hardy to zone 3. The white flowers of Dutchman's breeches are shaped just as the common name suggests. These perennials reach 6 to 12 inches tall with a similar spread. Deadnettle (Lamium maculatum) is a shade-loving perennial for zones 4 through 9. Deadnettle grows to a height of about 1 foot, at most, with a much greater spread. It does put out blooms, but it is more often grown for its medium green foliage that is splashed with silvery blotches. Not only does deadnettle love shade, but once established, it is also drought-tolerant, making it an ideal plant for rock gardens located in a shady spot. Just give it a soil with good drainage and let it go. It can be invasive in some regions. Vinca minor vine, the perennial ground cover with the cute common name of "periwinkle flower," is widely used as a ground cover in areas where lawn grasses just will not work. Grown in zones 4 through 8, Vinca minor vine requires good drainage. This shade-loving ground cover has traditionally been planted under large trees, where most lawn grasses would quickly have given up due to insufficient light. Vinca minor vine is a short plant, growing only 3 to 6 inches off the ground, but its trailing stems with evergreen leaves spread up to 18 inches. The stems root at the nodes as it creeps along the ground and spreads rapidly to form an attractive ground cover. Vinca minor vine puts out bluish-lavender periwinkle flowers in spring and may bloom a bit more here and there during the summer. Periwinkles are another invasive plant. If this is a problem for your region, use hosta plants instead. A more versatile vine for shade is climbing hydrangea (Hydrangea anomala ssp. petiolaris). It, too, can be used as a ground cover. But it is a much larger plant than Vinca minor, and it has a greater number of uses. For example, some owners of brick homes grow it up against their house walls. It is suitable for zones 4 through 7. Northern sea oat grass (Chasmanthium latifolium) grows 24 to 36 inches high in loose clumps of green foliage. Its name comes from its seed pods, which look like oats. This shade-tolerant ornamental grass is cold-hardy to zone 5. Fine fescue lawn grass seeds often come in bags mixed with Kentucky bluegrass. Buy any lawn-seed mixture labeled "for shade," which will include fine fescues, such as hard, chewing, and creeping red fescue. At least 80 percent should be fine fescue grasses. This shade-tolerant lawn grass grows in zones 3 through 8. An alternative is the new and improved class of tall fescue grasses known as "turf-type" tall fescues. When planting fine fescue seed in a shady area with trees, first use soil amendments, such as compost and peat moss, to improve the body of the soil so that it does not dry out easily. You will have trouble with your fine fescues if the soil has a tendency to dry out, which is precisely what will happen if tree roots are absorbing all of the available water in the area. At the same time, fescues do not want to be in excessively wet soil, so you should not plant it in areas that stay wet all of the time. Applying compost helps strike a balance between good drainage and water retention. Pardon the Interruption: How Did Interrupted Fern Get Its Crazy Name?